Coleraine's Stephen Hutchinson celebrates taking five wickets against Brigade. The weather once again took a chunk out of the weekend’s cricket programme with all of Sunday’s listed matches scheduled for the North West having to be abandoned following heavy rain. Bready, Coleraine and Donemana all had home ties in the Irish Senior Cup while Newbuildings were entertaining County Meath side, Knockharley, in the National Cup. All four matches were washed away without a result and will now be reversed and played at the “away” venues next Sunday instead. Ironically the teams on their travels this time all got their matches concluded but unfortunately for the North West sides none went through to the next round. Brigade were well beaten by Instonians in Belfast in the premier competition while Sion Mills, Burndennett and Killyclooney all lost in the National Cup. The ladies’ Interprovincial match between the North West and the NCU also fell victim to the weather as did the Championship game between Bond’s Glen and Strabane. It had been a similar story with a different ending on Saturday as the six senior matches in the Long’s SuperValu Leagues had all reached a conclusion of one form or another following a very long day. The Championship contest between Newbuildings and Strabane had already been set for next Sunday owing to a wedding in the home camp while Ballyspallen accommodated Burndennett ahead of their long trip to Cork for Sunday’s National Cup tie by postponing their weekend league clash. That meant a chance for Killyclooney to stretch their lead at the top of the table which they did by the very narrowest of margins at home to St Johnston. Glendermott also took the chance to get a few more points on the board as they easily saw off Bond’s Glen. Undoubtedly the biggest clash of the day was in the Premiership where Coleraine entertained a Brigade side still smarting from a league defeat at home to Donemana and an unfortunate bowl-out loss at Ballyspallen in the Senior Cup. Andy Britton’s men simply had to get something from the weekend’s trip to Sandel Lodge and Sunday’s match at Shaws Bridge, but they got neither. Five wickets for Stephen Hutchinson and four for Graham Hume saw Brigade dismissed for just 112 in the league game while a superb unbeaten 67 from 16-year old Marcus Poskitt meant a six-wicket win for the Bannsiders. Donemana continue to look menacing after they proved much too strong for Fox Lodge while Eglinton moved into the top half of the table with a thumping win over Bready. 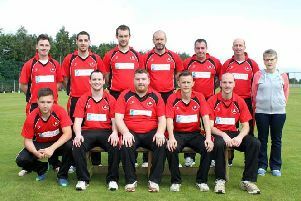 Drummond are stranded at the bottom after Ardmore posted their first win of the season, a 38-run verdict over the Roe Valley club.